Few things will get a lefty going today more than the words “white,” “Christian,” and “male.” It literally makes them go crazy. Or stupid. Or both. The news anchors and writers were barely able to even catch their breath after hideously, falsely, using variations of the word “impeach” roughly 18,583 times last week in their reports, on account of a yummy but oh-so-phony (yup, “fake news!”) Buzzfeed.com story, before breathlessly latching onto this new doozy at the end of the past week. 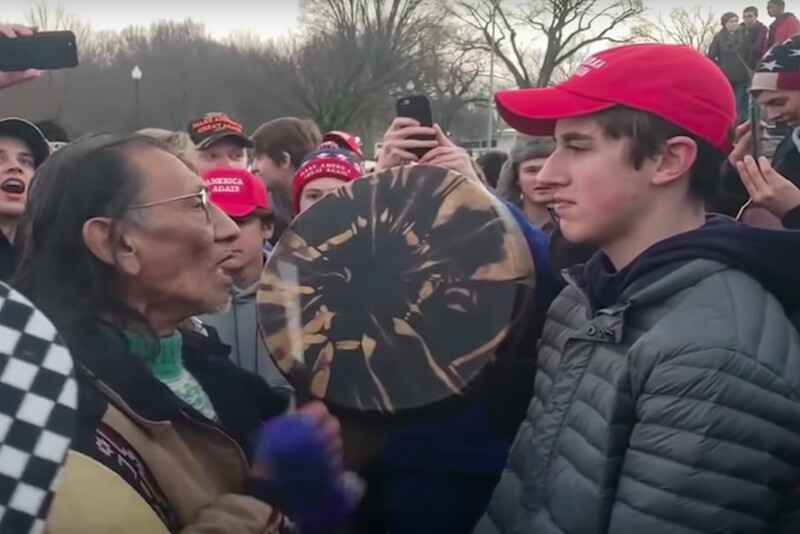 On Friday the news media outlets all, in amazing unity, used a totally out-of-context video which was purposely and nefariously provided to the news media with entirely fraudulent intentions, to smear as “racist” and “privileged” a group of innocent young boys from Kentucky’s Covington Catholic boys school who were in Washington DC to join in the annual (entirely peaceful) March For Life. The media repeatedly referred to the boys as “white,” “Catholic,” and “wearing MAGA hats.” All three of these words are used by the left as “dog whistles” meaning at least “bad,” but hopefully something far, far worse. But hoo boy all three at once? That’s like the trifecta for the left and their media; a license to “report” in the most reprehensible possible way. MAGA hats? White? Catholic? At a pro-life rally to boot? We can can call ’em anything we want, virtue-signal, advance our progressive agenda, AND smear Trump in the process! The only way this scene could be better would be if the boys were also sons of rich Texan oil tycoons or Fox News Channel anchors. Oh God this is perfect. Clearly now they can also add “racist” and possibly “white privilege” to their “reporting” …which of course they did, in spades. “Toxic masculinity” was another favorite among the idiotocracy. After engaging in as much identity politics as they possibly could in their first paragraphs, the news media stories went on to describe a completely phony narrative as delivered by the Indian man named Nathan Phillips. He lied, and the media ate it up. Then they all lied some more about the boys. Shortly after the story broke, just as with the Buzzfeed.com story, the story was shown, by a simple viewing of the whole video, to be utterly false. In fact completely opposite of what was reported. It was all a lie based on what the phony “victim,” the reporters and the producers and the editors of the news media outlets all knew — or should have known — to be a lie. The entire boys’ school is closed today out of fear for their safety. But there are other serious consequences: our growing and maybe now complete inability to trust the news media to perform their first and most important duty, which is to tell the truth; and to not be biased, or be lulled, willingly or not, into reporting based on their obvious confirmation bias. Repeatedly. The truth be damned. This is the new motto of the left, including their news media.